The Goodyear company hangar in Akron, Summit County, Ohio, ca. 1940-1949. In 1916, the Goodyear Tire and Rubber Company purchased land near Akron, Ohio to build a plant that could produce airships. In 1923, the main Goodyear Company created a subsidiary known as the Goodyear Zeppelin Company to manufacture airships, including airships for the United States Navy and for leisure. By the late 1920s and the early 1930s, among the firm's completed zeppelins were the Pony, Pilgrim, Puritan, Volunteer, Mayflower, Vigilant, Defender, Reliance, Resolute, Enterprise, Ranger, and Columbia. Most of these ships utilized helium to become airborne, while zeppelins originally used heated air or hydrogen. During this period, other companies, especially European ones, were constructing airships to transport passengers, including across the Atlantic Ocean. 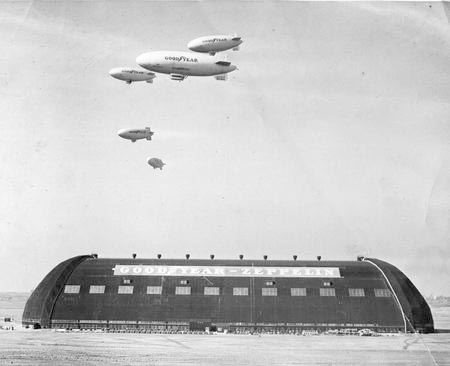 Goodyear also manufactured two airships, the Akron and the Macon, for the United States military during the early 1930s. During World War II, the company manufactured 104 airships for the military at its Akron facility. Allen, Hugh. House of Goodyear: Story of Rubber and Modern Business. N.p. : Ayer Co. Pub., 1976. Beasley, Norman. Men Working: A Story of the Goodyear Tire and Rubber Company. N.p. : Harper & Bros., 1931. Korman, Richard. The Goodyear Story: An Inventor's Obsession and the Struggle for a Rubber Monopoly. N.p. : Encounter Books, 2002.